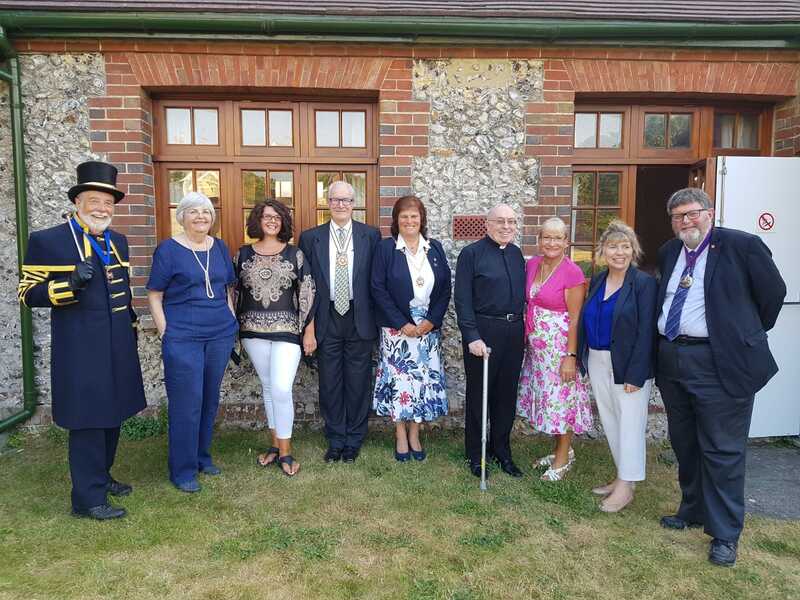 The Mayor of Seaford Cllr Linda Wallraven officially celebrated her induction as Mayor at a Civic Service held on Sunday 8th July at St Andrew’s Church in Bishopstone Village. The Service was led by Father Trevor. Various dignitaries were in attendance, including the Deputy Lieutenant of East Sussex, Mr Christopher Whittick, the Mayor of Peacehaven and councillors of Seaford Town and Lewes District. Friends, family members and associates of the Mayor also attended the service, as well as members of the public. Fr. Trevor encouraged everyone to join together in prayers for the Mayor, for the town of Seaford and its community. Mr Philip Pople read the first reading and the 2nd lesson was read by the Chairman of the Royal Society of St. George, Mr Robert Peedle MBE. The Mayor’s address introduced her chosen charities for her Mayoral year; Teddy Treats and Seaford Museum & Heritage Society. Kay Turvey of Seaford Museum & Heritage Society and Founder of Teddy Treats, Brenda Edwards, gave a brief talk about their charities and the plans for the forthcoming year. Attendees also joined in with hymns relating to the sea and of course finished with ‘Sussex by the Sea’. A retiring collection of £201.00 will go towards the funds raised throughout the year for both Teddy Treats and Seaford Museum & Heritage Society. Cllr Wallraven is quoted as saying “My Civic Service was well attended, and I welcomed Deputy Lieutenant Mr. Christopher Whittick amongst other distinguished guests and representatives of our community. The service was led by Father Trevor who has just returned and is still recovering from a long illness, it was lovely to see him back. Sergeant-at-Mace, Mr. Peter White, carried the Town’s Mace and Mr. Frank Holland carried the Standard of the Seahaven Branch of Royal Society of St. George. During the service I was able to introduce my two chosen charities for my Mayoral Year which are Seaford Museum & Heritage Society and Teddy Treats, who also gave a brief representation of the work their charities do. I am keen to support Seaford based charities especially if they haven’t been a Mayoral charity before. The service ended with Sussex by the Sea. The congregation were very generous by leaving £201 in the retiring collection. After the service there was a reception of tea and cake in the Parish Hall which was well received. I would like to thank St. Andrew’s Church, Bishopstone once again for hosting my Civic Service and the support they give me”. Pictured left to right – Mr. Peter White, Sergeant-at-Mace; Mrs. Kay Turvey, Seaford Museum & Heritage Society; Mrs. Brenda Edwards, Teddy Treats; Mr. Christopher Whittick, Deputy Lieutenant, Mayor; Cllr. Linda Wallraven; Father Trevor; Mrs. Liz Holland, Mayor’s Consort; Maria Caulfield, MP; and Cllr. Peter Pragnell, Chairman of East Sussex County Council.